Editor’s note: While WalcomS7 no longer writes for Blasterhub, we encourage you to view the content on his Youtube channel! With so many great blasters releasing in 2015, it’s no surprise that a few fell through the cracks. The Nerf Rival line debuted to thunderous applause, Buzz Bee relaunched it’s line with a slew of high-performance magazine-fed dart blasting options, and BOOMco had finally gotten itself back on track after the Gripstrike and Slamblast with such treasures as the Breakflip or Colossal Blitz. The BOOMco Burst Wave was just something that felt like the cherry on the top of the sundae. 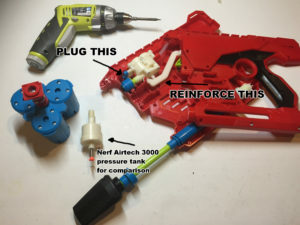 It was a completely unnecessary love-letter to blasters of the past that injected some much needed hope into the blasting community: a pneumatic air-powered blaster with a pump and a trigger. This might not seem like much, but after how Buzz Bee had been limiting their pressure tanks to such minuscule sizes and NERF was all about the new High Air Pressure Manual Pump (or HAMP) in the Demolisher 2-in-1 or Thunderblast presumably out of legal reasons; seeing a new option pop up out of seemingly nowhere as a pleasant surprise. Oh, and it happened to be a four-dart spewing shotgun with three rotating chambers. In the game of projectile tag, one dart is generally all it takes, so fielding lots of projectiles in the minimal amount of time is preferred. Sure, you can fire one dart after another incredibly fast; but what about firing lots of darts with one pull of the plastic trigger? Shotguns are a lot of fun, and BOOMco managed to create the most war-practical option of any company. Not only is the Burst Wave highly effective as a close-quarters blasting option in it’s stock form due to it’s multi-dart spread, it can be modified relatively easily to become a truly formidable staple in toy combat. 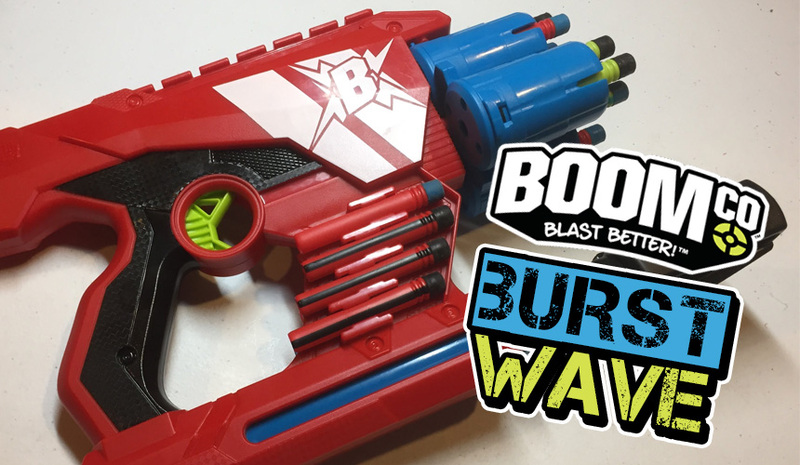 Being a BOOMco blaster, the Burst Wave shoots your standard BOOMco projectile; those straw-like darts with the soft rubber heads that magically stick to their own Smart Stick targets (or if you’re feeling fancy, regular printer photopaper). While BOOMco is newer to the game and it’s ammo type isn’t as widely available in many games like the foam flingers, the darts do have superior durability and accuracy giving them a very attractive allure to many veterans. When you turn this into a shotgun spread, you get a very stable ranged foot-print to hit your targets with. The ranges out of the box are fair for a shotgun: claiming up to 50 feet and hitting around that mark reliably well with the appropriate angle. 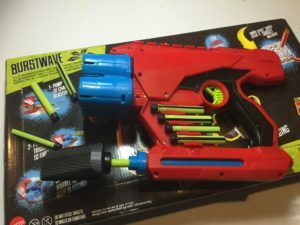 This makes sure the Burst Wave sits in it’s correct blasting tier as a shotgun, something appropriate of tagging out opponents in close quarters or around corners and giving them less room to avoid darts and giving you more room for errors in accuracy. Besides, it’s slower firing speed will ensure you won’t burn through your available ammo too quickly. 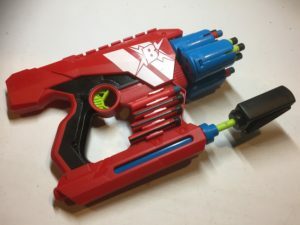 The design of the blaster is compact and what little extra space was left over is used for some additional dart storage on both sides of the shell. The pump is comfy and serviceable but a bit thin and may be prone to bending if mishandled. The trigger pull is excellent, with the slide-back trigger pushing a small roller connected to a plastic arm the depresses the blast button and releases the air pressure creating a very smooth function not often found in air blasters. The three open-faced turrets (two on the blaster, with the third being separate and needing to be snapped into place) hold four darts each and rotate manually in either clockwise or counter-clockwise directions with a satisfying click. Yes, I said manually: you have to rotate these turrets by hand, but it’s a trade-off that had to be made for the perfect turret to tank seal this blaster achieves. Finally, there’s a loop at the top to secure your armament to a sling or belt clip and a BOOMco accessory rail if you want to include any compatible attachments. The overall blaster is thin in every area except for the turrets which protrude outwards, yet the grip is comfortable and the blaster feels almost lively in the hand. Operation is straightforward: load the turrets with darts, snap a turret into the firing position, pump the blaster up 3 to 4 full strokes (which at this point the over-pressure release valve kicks in making subsequent pumps pointless), and pull the trigger to fire. You get yourself three shotgun blasts before having to reload, and the dart storage will give you two additional reloads before needing to procure darts elsewhere. Because it doesn’t take many pumps and the turrets firmly snap into place when rotated, firing off all your shots doesn’t take much time and with practice can be pulled off with relative ease. Not only are the ranges on-par and even superior to blasters such as the Nerf Zombie Strike Sledgefire, but it fires quicker and with an additional dart making this a very effective blaster in capable hands. But only 3-4 pumps? Come on, we can do better than that, right? Bust out the screw driver and hot glue gun and you can easily get this thing firing much harder and the mod itself is difficult to mess up. Your first obstacle after removing the screws is the plastic ring securing the pump: on some versions this is just friction-fit on and will pop loose without any effort, but on other versions is adhered with glue and will require some effort to remove. Once open you can ignore virtually everything apart from the tank itself and the arm that depresses the blast button on the bottom of the tank. First, you need to plug the over-pressure valve on the tank itself: the easiest way I found of doing this was to unscrew the plate that holds the release piston and o-ring, pop those out and remove the spring, place the rest of the pieces back in and fill it full of hot glue, then secure the plate back on. Next up, with the increased pressure the tank can now build up, the thin plastic arm the presses in the blast button will fold in on itself because it doesn’t have the structural strength needed to force that button down; so fill that full of hot glue (or if that doesn’t work, epoxy putty) and that will let you build up some intense pressures in the tank. Now your blaster will be hitting double the distance at greater speeds, though it will require around 15 pumps as opposed to the original 3-4. In my opinion, this was the best blaster of 2015. It came out of nowhere and it was amazing, yet few people even remember it exists when brought up in conversation. If you don’t already own one of these, you owe it to yourself to pick this blaster up before it disappears off shelves forever to make way for newer products. It was an amazing blaster in it’s stock form and it’s modification costs pennies on the dollar and gives you unparalleled multi-dart performance. It’s one of the few BOOMco blasters that can be modified relatively effortlessly, and thus it’s one of their few products that show the true capabilities of the line. Not many people remember you, Burst Wave; but I know I’ll never forget you. If you want my absolute first impressions of the blaster, you can watch my unboxing video here. Too hard to mod? I made some videos on the process here. This entry was posted in Modifications, Reviews and tagged air, blaster, boomco, Burst, Burstwave, mod, Modification, Mods, nerf, Pneumatic, Pump, review, Shotgun, Turret, Walcom, WalcomS7, Wave on May 26, 2016 by WalcomS7. We dont have these here. I really wanted to buy one of these. Wish I could have gotten one while it was out on shelves. Alas, it’s too late. Even on eBay and craigslist you can’t find any.